Chris Hemsworth ... Wally Jr.
Crocodile Dundee is back. Well, actually, he's missing in the Outback. And the only person who might be able to find him is the loudmouthed American son no-one knew he had. 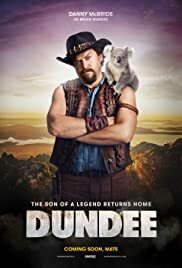 Introducing Danny McBride as Brian Dundee. This son of a legend is forced to channel his Aussie roots as he embarks on the ultimate adventure in the land down under. It's time to live up to the family name. If you have a heart you will make this happen, either you or I will.